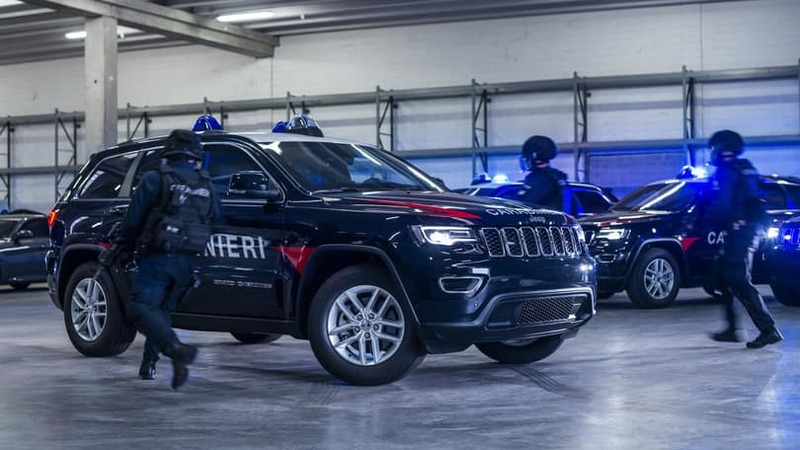 The gendarmerie of Italy, the Carabinieri, has acquired a special fleet of 19 heavily-modified Jeep® Grand Cherokee SUVs as patrol vehicles. Seemingly scheduled to arrive at the anti-terrorism unit of the Carabinieri, this special fleet appears to be out to get the really, really bad guys thanks to the very long list of modifications made, including severe bulletproofing. This fleet of Grand Cherokee SUVs is properly outfitted in a Carabinieri uniform, with a Carabinieri decal on the sides and blue strobe lights on top. The SUVs will be powered by a 3.0-liter V6 diesel engine that produces 190 horsepower – the same stock engine remains in place thanks to its reliability and efficiency. The diesel engine option equivalent that’s available in the U.S., the EcoDiesel, generates 240 horsepower and up to 420 lb-ft of torque. What do both variants of this vehicle share in common? An eight-speed transmission that feeds the Grand Cherokee’s four-wheel-drive. As for customizations, the Carabinieri Grand Cherokee features upgraded suspension components to support all of the extra weight from the bulletproofing parts and for better on-road capabilities. Speaking of bulletproofing, the windows, front windshield, body panels, and even the tires of this Grand Cherokee have all been outfitted and armored for the much-needed protection of the officers. Additionally, these special vehicles also come with a seven-inch Android tablet that’s outfitted with the Odino police database system, allowing patrolmen to access several of the country’s law enforcement databases with rapid ease. Fiat Chrysler Automobiles (FCA) continues the tradition, as the newest Carabinieri Grand Cherokee collaboration is a testament to FCA’s commitment to Italy’s paramilitary task forces. The Carabinieri Grand Cherokee will be in good company as a few of its siblings will be working side by side – Renegades and Wranglers are already in service with other branches. A Jeep Wrangler beach patrol vehicle was introduced this past summer as part of a larger surveillance program on the Romagna Riviera – an 18-mile stretch of beach that includes the frequently-visited resort towns of Rimini and Riccione. The law-enforcing Wrangler is powered by a 2.8-liter Common Rail Direct injection turbo diesel engine paired with an automatic transmission. Equipped with the high-performance off-road Mopar One Pack, the beach-patrolling Wrangler has a two-inch lift kit by Fox Performance, a front steering stabilizer, 17-inch performance Gladiator black alloy rims, 32-inch all-terrain tires, front and rear molded splash guards and side mudguard extensions. Special Carabinieri equipment also makes an appearance on the modified Wrangler, including a flashing light, a siren with telescopic mounting, a portable radio, and a machine gun holder! The relationship between FCA and the Italian Carabinieri dates back to post-World War II Italy when all of the patrolling cars were designated as Alfa Romeo vehicles, starting with the Giulietta and eventually transitioning to the Giulia model in recent times. While these vehicles won’t be making their way stateside to Jeep dealerships, it’s still amazing to see how modifications can transform a vehicle. Have any questions on Italy’s FCA-powered Carabinieri force? Let’s chat about it on Hollywood Chrysler Jeep social media.